(11-07-2018, 12:58 PM)Don C Wrote: Try searching for "automotive carpet pad (or padding)". When I was looking I went to a heat and air conditioning supplier. Was going to put the semi rigid fiberglass duct insulation but went with the stick on foam with foil. Not going to be judged at the shows I go to. I did get some of the under carpet pad that is like ground up rags to go back under the carpet and also for the pads on the rear wheelhouse to protect the top when down. The material under the Cowl that Ford used is some very light insulation and not jute. I do not know that the under carpet pad would ever stick good enough and just fall out except where something is in the way. The pic Fabrice posted sort of answers a thought I had. Did Ford have one insulation that had the cut out for the L.H. vent but left it in place for an AC car. That looks like the piece that fell out. That would be my guess - one piece that has punchouts for version specific accessories. totally, its hold by very tiny bits of the plastic layer. Make sens to have all ready and just push or leave a piece depending on order list. Found some results and got to see that "jute", which is what I've used else where but not called jute here Learning everyday, thx! When I hear "Jute" I'm thinking of potato bags, kinda mesh looking brown material. I had typed this up before but when I went to get pics it all went away, lol. I finally found the right bin with the insulation in it. For some reason it is always the last one I look in, lol. 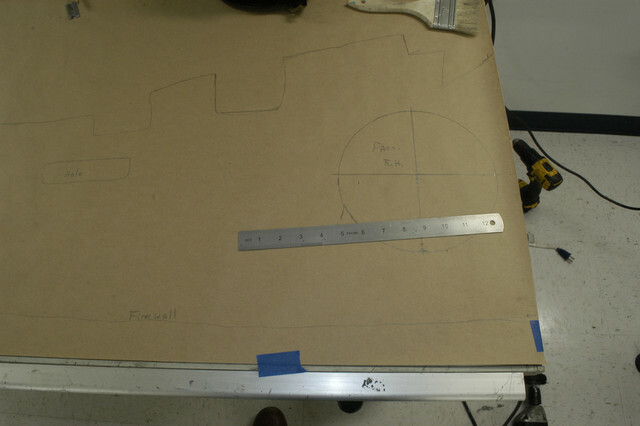 I put masking paper on the drafting table work bench and put the insulation on it. Not really a straight edge on it except the ends. One end was missing so I measured from vent opening and allowed for that. I do not think a jute material or carpet underlay will ever work. Too heavy. It looks like the factory sprayed contact cement and put the insulation in place first thing. They had installed one of the air vents on top of the insulation in one place. If you use something heavy you will have to use some type fastener to keep it in place. I will send Mike the first layout. I thought I was going to cut them out but best not to. I will go down the list of PM's sent and do as I have time. Also a pic hanging on wall in the workroom. I use to go to Ohio Truck during launch each year we supplied bunch of parts to them. Hanging on the wall in the Buck room was a blueprint of a Model T. I ask one of the guys if I could get a copy and he scanned and sent to me. It got crumpled up over the years before I put into the frame. If someone was going to try to reproduce this they were made using a process called steel rule die sometimes called a cookie cutter die. They are usually made by sawing a piece of plywood with band saw and inserting a hardened steel blade in the slot. In the press it came down and hit the material and cut against a hard rubber surface or sometimes piece of wood. There is a 20 oz Jute on eBay that is 1/4 in thick. I think this would be sufficient, but do not know for a fact. For a little over $8 for a yard I woud say it was worth a try. I thought that was probably the case. I believe that what we call jute padding was originally jute fibers bonded, not woven, together. Today's "jute" padding seems to be recycled cloth fibers, and the old name kept being used. 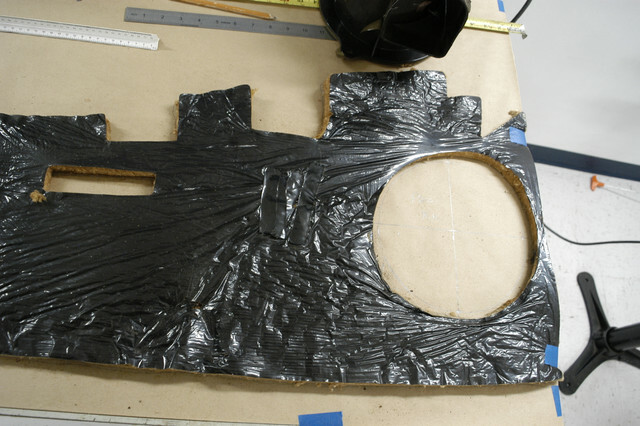 The padding in older cars was the brownish colored fibrous material. I have a couple of different weights of jute on the way. 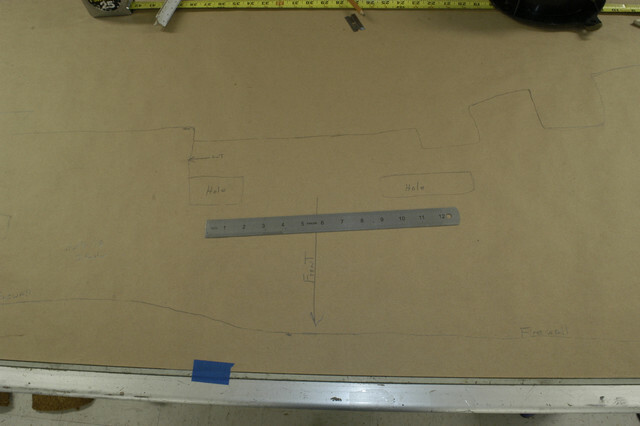 I'll figure out what works best and transfer Dave's tracing to some fiberboard. That way I can make some reasonable copies if anyone is interested.